In this course you are going to see a few topics covering some basic optimizing and troubleshooting in SQL Server. You will see what Trace flags are and how they are used to alter the behavior of SQL Server. Sometimes this is useful, sometimes it is dangerous and sometimes it is just bizarre what they do. You will see how the use of trace flags to capture deadlock information so you can more efficiently troubleshoot the cause. Then you will see blocks, a common issue in SQL Server and see how to determine which process is blocking others and how to resolve it. 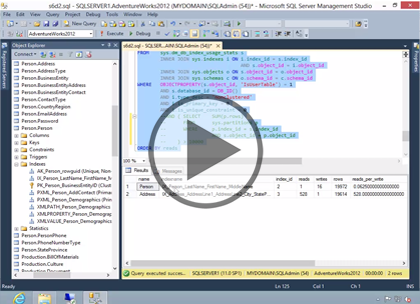 Next you will then go through a series of DMVs that are quite useful in optimizing and troubleshooting SQL Server. You‘ll see some DMV based queries used all the time to check indexes fragmentation and usage along with a query to identify the most expensive queries in your database. This course assumes that students have working experience with SQL Server; basic relational database concepts (e.g., tables, queries, and indexing); general knowledge of XML, Transact-SQL, and a fundamental understanding of networking and security concepts. Chris Bell, MCITP, is an 18-year SQL Server veteran for both business intelligence and application development providing solutions for businesses, organizations, and individuals. He is the founder and CEO of WaterOx Consulting, Inc., a provider of remote SQL Server consulting and services. Chris is also the founder and current President of the Washington DC chapter of PASS and a member of the Board of Directors for CPCUG. Chris also frequently attends and presents at PASS events around the country, sharing his passion for all things SQL Server. In 2012, Chris was one of 5 finalists in the world for Red Gate&rsquo;s Exceptional DBA Award.